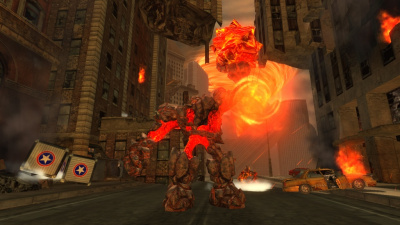 An Iblis Golem in Crisis City. Golems are supernatural fire-beasts conjured and controlled by Iblis out of the Flames of Disaster, and which serve as opponents in Sonic the Hedgehog (2006). These fire monsters are lava giants, encased in cooled molten earth that acts as armor. This armor deflects lesser attacks, so only direct hits from Homing Attacks or thrown objects are enough to bring down this monster. The golem’s weak spot is the head and occasionally, the golem will open the top of its “skull,” revealing a glowing lava core, and it's also possible to stun and levitate them with Silver in this state. It takes half as many hits to the weak spot to bring down a golem as attacking it directly. Golems have two attacks: they can throw large lava balls at enemies or smash their fists into the ground, releasing a small shockwave. They differ from the Titans by being weaker, having an red-brown colour and taking three direct hits to destroy. They sometimes act as leaders of a group, but not always.